The Levelogger® Gold is completely designed, developed and manufactured in-house, in the tradition of all Solinst high quality products. Due to the Solinst commitment to providing leading-edge instruments designed for repeatable accuracy, the Levelogger Gold is always advancing. 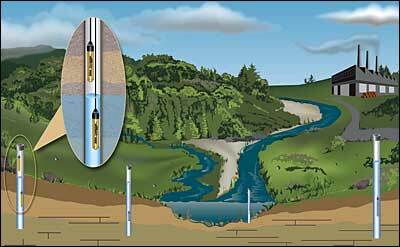 The Levelogger Gold is a water level and temperature recording device. It combines a datalogger, 10-year battery, pressure transducer and temperature sensor, in a small, minimal maintenance, 7/8" x 6" (22 mm x 154 mm) stainless steel housing. The sealed Faraday cage design greatly simplifies maintenance and provides protection against electrical spikes caused by lightning. A Zirconium Nitride coating resists corrosion. The Levelogger Gold offers high resolution and reliability with an accuracy of 0.05%. 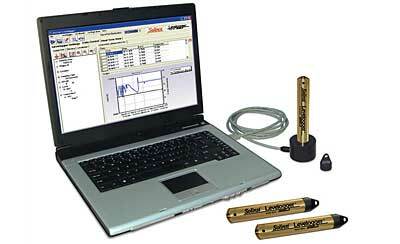 The Levelogger Gold has excellent transducer, temperature and clock accuracies. Altitude, water density, temperature and barometric compensations also add to the accuracy and instrument stability. High accuracy, long-term stability and an internal battery that lasts for 10 years when reading every minute, make Leveloggers the ideal devices for recording water levels. 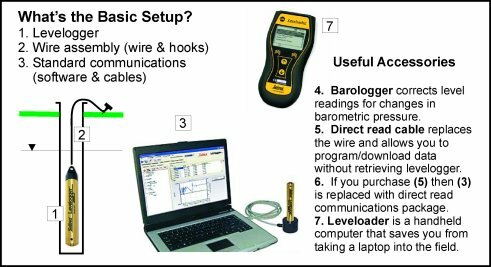 A Barologger provides theeasiest and most accurate method of barometric compensation. The Levelogger Gold memory allows a maximum of 40,000 readings of level and temperature, set up in individual logs. The user has a choice of slate or continuous logging when operating in linear mode. In event-based and schedule sampling, memory is a form of circular slate, which starts logging from the end of the last log and wraps around to eventually overwrite older logs, but which will stop at the start of the current log. A separate redundant memory provides backup of the last 1200 readings, which can be accessed by a Diagnostic Utility program. The Levelogger Gold offers 4 download options: ‘All Data’ downloads the complete log, or the user can save time by selecting ‘Append Data’, when only new data is desired. A selected period of time prior to the last date stamp can be downloaded using ‘Partial Download’. ‘Recover Previous Log’ is a safeguard in case the Levelogger has been restarted without downloading data. A complete data dump is also available as a feature of the Diagnostic Utility, which downloads all available memory in the Levelogger Gold. The Levelogger Gold has an accuracy of at least 0.05% net FS, a resolution of 0.0006 to 0.002% depending on range, a Barologger with algorithms based on air not water, enhanced altitude, density, temperature and barometric compensation, as well as a very accurate clock. Solinst includes a very flexible, user-selectable sampling schedule, as well as the standard linear and event-based sampling options. Linear sampling can be anywhere from 0.5 seconds to 99 hours. Event-based sampling can be set to record when the level changes anywhere from 0.1% up to 25% of the full range of the logger. Readings will be checked at the selected time interval, but only recorded in memory if the condition has been matched or exceeded. The Schedule option allows up to 30 schedule items, each with its own sampling rate of seconds, minutes or hours, and a duration of seconds, minutes, hours, days or weeks. A running total of sample time and number of readings available are indicated and updated. Templates of these Schedules, and Levelogger Settings, can be saved for easy re-use. 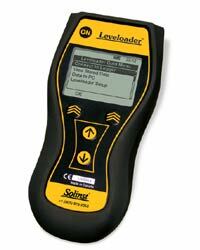 Solinst has made programming the Levelogger Series extremely intuitive. Simply place the Levelogger in the optical reader or connect to the direct read cable. All in one screen, fill in the information fields for location, project ID, sample mode and rate, altitude, density adjustment and any desired offset. Levelogger time may be synchronized to the computer clock, or the Leveloader Gold clock, or it can be user defined. There are options for immediate start or a future start time. The percentage battery life remaining and the amount of free memory are indicated on the settings screen. A manual measurement of the initial water depth is usually taken at each location, and noted as a base line measurement. 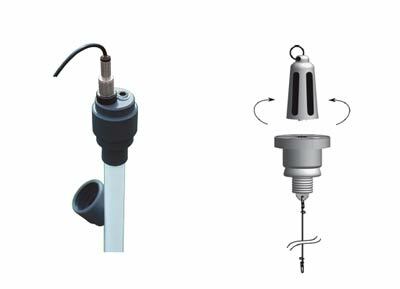 When a Barologger is used for barometric pressure measurement, it is set above high water level in one location on site. If direct read cables are being used, data can also be viewed, logged on demand and retrieved from the Levelogger at any time using a Leveloader or a portable computer. Data is downloaded to a PC with the click of a screen icon or with the push of a button on the Leveloader. Collected data is retained in the Levelogger until it has been written over. The level data downloaded from a Levelogger has already been automatically compensated for temperature and altitude and the temperature data is also downloaded. Barometric compensation of the Levelogger data is performed by a Wizard that can be used to input elevation offsets and adjust for Barometric efficiency. The software allows immediate viewing of the data in graph or table format using the ‘Real Time View’ option. It also allows easy export into a spreadsheet or database for further processing. When it is desired to get real-time data and communicate with Leveloggers without removal from the water, they can be deployed using direct read cables. The lower end of the direct read cable has a miniaturized infra-red optical reader. The top cap of the Levelogger is removed and the direct read cable is threaded in its place. In turn, the upper end of the cable is attached to a portable computer or Leveloader, via a USB or RS232 PC Interface Cable. 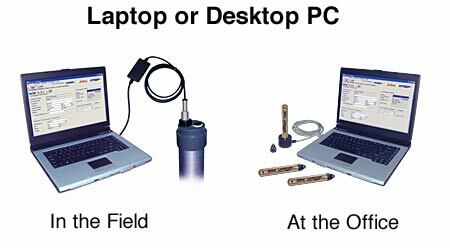 This allows viewing of the data, downloading and/or programming in the field. Leveloggers can also be connected to an SDI-12 datalogger using the Solinst SDI-12 Interface Cable attached to a direct read cable. The full benefits of a sealed Levelogger with no vent tube or electrical cable connection are also maintained. The logger is still sealed from all electrical interference through a Faraday cage design. Cable handling problems are minimized. Direct read cables are available for attachment to any Levelogger, new or old, in standard lengths of: 15’, 50', 100', 200', 250', 300' and 5 m, 15 m, 30 m, 60 m, 80 m, 100 m. Custom cable lengths up to 1500 ft (450 m) are also available to fit particular monitoring situations, as required. Cable markings are available upon request. The 1/10" dia. (2.54 mm) coaxial cable has an outer polyethylene jacket for strength and durability. A stranded stainless steel braided conductor gives non-stretch accuracy. The upper end of the direct read cable is fitted with a connector that can act as a well cap for a 1" well. This connector fits Solinst Levelogger well caps designed for 2" or 4" wells, and can easily be tethered at surface in other situations. Leveloggers may also be suspended in the water on a stainless steel wireline or Kevlar® cord. This is a very inexpensive method of deployment, and if in a well, allows the Levelogger to be easily locked, out of sight and inaccessible to anyone without a special key. Solinst has adapted the Enviro Cap™ by adding a vent hole in the cap to allow for the equalization of barometric pressure in the well. The well cap has a convenient eyelet from which to suspend the Levelogger. It slips into the casing and is locked in place with the tamper-proof key, as shown. The Enviro Caps are available sized for 2" and 4" wells. Well caps for other sizes of well can also be used. Leveloggers measure absolute pressure (water pressure + atmospheric pressure) expressed in feet, meters or centimeters of water column. The most accurate method of obtaining changes in water level is to compensate for atmospheric pressure fluctuations using a Barologger. This avoids any time lag in the compensation calculation and any errors introduced due to moisture buildup, kinking or damage to vented cable. The new Barologger Gold uses algorithms based on air rather than water pressure, which gives superior accuracy. The recorded barometric information can also be very useful to help determine barometric lag and/or barometric efficiency of the monitored aquifer. 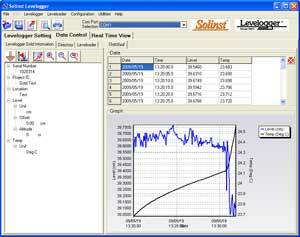 The Data Compensation Wizard in the Levelogger software greatly simplifies the barometric adjustment of the water level measurements by using the synchronized data from one on-site Barologger with all the Leveloggers. The overall results give more reliable, highly accurate level data than that obtained when using high maintenance and expensive vented cable. The ‘Self-Test Diagnostic Utility’ can be used in case of an unexpected problem. It checks the functioning of the program, calibration, backup and logging memories, the pressure transducer, temperature sensor and battery voltage, as well as enabling a complete Memory Dump, if required. A Firmware Upgrade will be available from time to time, to allow upgrading of the Levelogger Gold, as new features are added. Note: The Model refers to the approximate range of total water level fluctuation e.g. the F15/M5 Model can handle approximately 15 feet or 5 meters of change in water level, at its deployed depth. 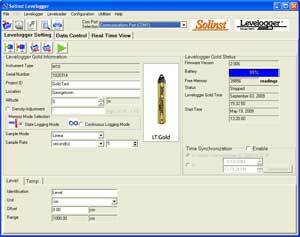 The Leveloader Gold is a data transfer unit designed for use with all versions of the Solinst Levelogger, Barologger and Rainlogger. It is used to download and store multiple data files. The 8 Mb FLASH memory stores up to 1,390,000 LT readings, 930,000 LTC readings, or 34 full Levelogger downloads. It can also be used to display data in real-time, and has optional password protection. Simply use the connector cables for attachment to a Levelogger, or to a direct read cable, to allow downloading or reprogramming of the Levelogger settings in the field. It comes with cables for USB and RS232 connection to a PC for data transfer. 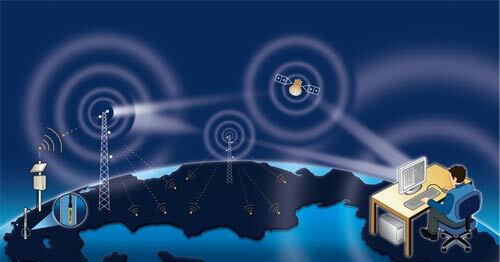 The STS Gold Telemetry System provides an economical and efficient method to access remote data instantly. Built for the Levelogger Series, the system combines high quality dataloggers, intuitive software and a variety of wireless communication options to create a remote monitoring solution. CDMA and GSM digital cellular, satellite and radio wireless communication options give the flexibility to suit any project. Systems are suitable for both small to large networks. The STS Gold is designed to save costs by enabling the self-management of data, as well as remote collection of the data. Alarm notification, remote firmware upgrades and diagnostic reporting make system maintenance simple. The inexpensive RRL Radio Telemetry is ideal for short range applications up to 1000 ft (300 m). Distances can be increased by using some radios as ‘repeater’ stations.